Learning to check a horse's teeth is an important skill for all horse owners. Before attempting to open your horse's mouth for inspection, have your equine dentist or veterinarian show you how to do it safely. Horses have tremendous chewing power and your fingers and hands are at extreme risk when in close proximity to the horse's teeth. On a regular basis, handle your horse's head and mouth area to make the horse comfortable with having the mouth examined. If you own a foal, exam the foals teeth as soon as possible, checking for baby teeth called caps that are pushed out by the growing permanent teeth by the time the horse is about two years old. If caps are creating pain and soreness, you may have your veterinarian remove the caps. The same goes for wolf teeth that are extra teeth and may grow in crooked or in the wrong spot. 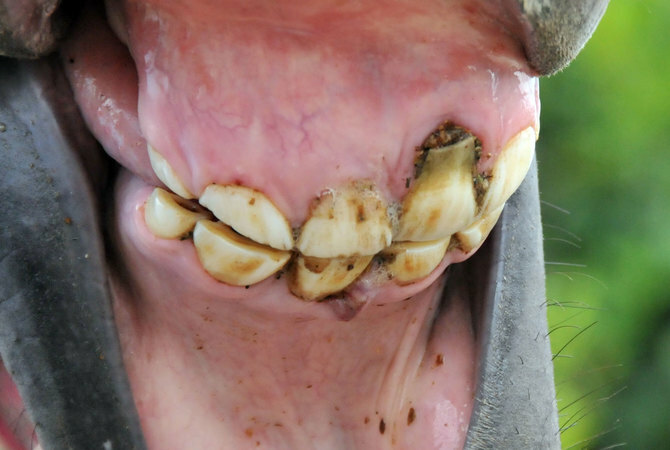 With an adult horse, open the mouth and check for uneven wear on teeth resulting in points or sharp edges that will keep the horse from properly chewing feed. Also note any teeth that are being to protrude excessively or cause mal-alignment or malocclusion. Note any changes in eating habits, loss of weight, bad breath, dropping half-eaten food, holding the head at a strange angle, bolting or head tossing when being bridled or ridden. Any of these conditions may be caused by dental problems. Any of these problems indicate that your horse should be examined by an equine dentist or by your veterinarian to determine if the horse needs dental care to take care of the problem. As your horse gets older, frequency of exams should be increased because of possible periodontal disease caused by a break down in tooth and gum structure leaving food and bacteria trapped in gaps or holes created by loss of teeth, fractured teeth or tissue damage that develops as the horse ages. In such cases, the horse may need corrective work along with a series of antibiotics for the mouth to completely heal.